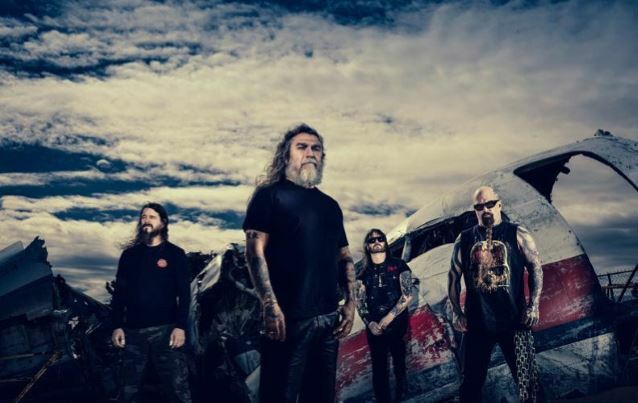 SLAYER's latest album, "Repentless", was released on September 11, 2015 via Nuclear Blast. The follow-up to 2009's critically acclaimed, Grammy-nominated "World Painted Blood" was produced by Terry Date, who has previously worked with PANTERA, DEFTONES and SOUNDGARDEN. The artwork was created by Brazilian artist Marcelo Vasco in collaboration with Tom Araya and Kerry King. LAMB OF GOD released a new EP called "The Duke" on November 18 via Epic. The EP's title track, which was recorded during the sessions for the band's last album, "VII: Sturm Und Drang", was inspired by the plight of a LAMB OF GOD fan named Wayne Ford, who was diagnosed with leukemia in 2010 and died five years later at the age of 33. The EP includes another previously unreleased track that dates back to LAMB OF GOD's "Wrath" LP, the thrashy, heavy "Culling", which the band finished up especially for this EP, along with live recordings of three "VII: Sturm Und Drang" tracks. "VII: Sturm Und Drang" was released in July 2015 via Epic in the U.S. and Nuclear Blast Entertainment in all territories outside of North America. The CD was once again produced and mixed by Josh Wilbur with engineering by Wilbur, Nick Rowe and Kyle McAulay, and was recorded at NRG Recording Studios in North Hollywood, California and Suburban Soul Studios in Torrance, California. BEHEMOTH last year completed a North America tour where the band played its latest album, "The Satanist", in its entirety. In addition to the concert, fans also had the chance to view "The Congregation" exhibition at each venue. Dubbed "a symbiosis of BEHEMOTH and Toxic Vision," the display showcased the collaboration between the two parties. "The Satanist" sold around 10,000 copies in the United States in its first week of release to debut at position No. 34 on The Billboard 200 chart.